comments = You have given me a TON of info about my dryer vent, and I appreciate it. Can you help me with the one problem that is driving me mad? I can’t get my vent to stay attached to the back of my drier! Is it safe to use duct tape to tape it in place? How long does the hose have to be? My dryer is close to a wall (in a closet) and I am wondering if I am using too long a vent hose and this might be making it easier for the thing to fall off. OH GREAT SAMURAI, HELP ME!!! Please open your appliance repair hymnal to page 127: The Ultimate Dryer Venting Guide. Wherein it is written… well, lots of stuff about dryer venting and dryer venting materials. Of particular interest to you would be the 4″ vent hose clamps at the bottom of the list. Here’s a free tip: always make your 90-degree turns using a pre-formed, aluminum fitting, such as this one. And the spiral-wound slinky hose should only be used sparingly, to make tricky connections. 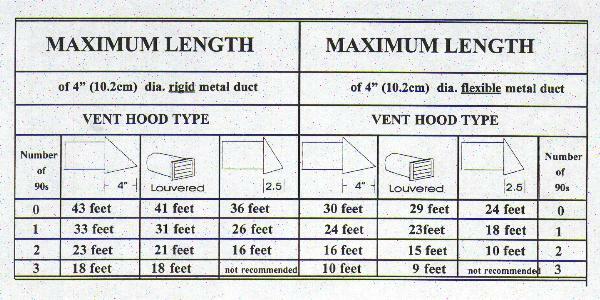 See The Ultimate Dryer Venting Guide for lots of other dryer vent construction materials and kits. As for dryer vent length, that depends on several things, like the vent material, number of turns and bends, and type of discharge hood. The diagram shown here explains, click it for a larger view. This entry was posted in Dryer Repair on November 16, 2006 by Samurai Appliance Repair Man.